Day One is my go to journaling application. Instead of mindlessly tweeting throughout the day I use this simple app to take notes on what’s going in my life privately. I used to run my diary in Evernote, but it all got messy, because I didn’t have a reliable way of retrieving information, I couldn’t know what happened when… And Evernote was simply to much clunky for the calm reading environment. It took me a while to import all the 250 diary entries from Evernote, into the Day One, because I didn’t know any other way to do it. But in the end of the day it was worth it! The main two reasons why I am using this instead of Evernote is it’s design and calendar. These two alone are making it a perfect journaling app. Simple, yet awesome. Some might argue that you don’t have photo support, to be honest I want my memories contained in the simplest way possible. Kept in such a way, that when I export them I can easily get them back in a .txt format. iOS and OS X apps – It covers your laptop and your iOS devices. It gives integrated experience across all of the devices. Reminders – Reminders are good, but they don’t cross sync between devices. (I am being spoiled I know 🙂 They show up in your notification center on iPhone. Quick Entry on OS X. This little thing pops up when as your reminder that it’s time to write. It made me capture so much thoughts over the course of the working day, it’s ridiculous. This feature is pure gold. But on the other hand doesn’t create a lot of distraction. iOS version covers both, iPad and iPhone (iPod touch) and costs 1.99$. It tends to remind me of Twitter. It is supported by Launch Center Pro. Definitively worth your money. OS X Version usually costs 10$, but I believe they’ve lowered it to 4,99$. And in my humble opinion if you want a long term solution for your journaling needs, it’s very well worth the money. I like the fact that the developer promised a lot of new features. Ask the readers: What are your favorite applications? #6 should read: “Full screen support on the iPhone”—not “iOS”. The lack of fullscreen support for the iPad has irritated me from . . . the beginning. I’ve always found writing in a right-justified pane awkward due to the lack of symmetry (one of several reasons I don’t use Notes on the iPad. Hopefully, the update that’s been sent to Apple for review includes fullscreen for the iPad. Yea, I phrased it correctly. I didn’t mind full screen support for iPad, since it has large enough screen size, and most of my journal entries are either on laptop or on iPhone. I’ll have to check this out. I love Evernote, but that doesn’t mean it’s the best. They included photos in the new version and some more neat features, so I highly recommend it. 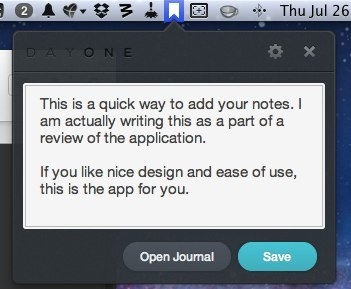 Day One still has no Evernote support, which is still a deal breaker for me. I guess you haven’t been whining enough. Have you ever received any feedback with regard to Evernote integration? No, but by the developers ambitions about the software, seems like he doesn’t intend on implementing it. I’ve ditched Day One, and use Dropbox text files.